Accredited certification to ISO/IEC 27001 demonstrates to existing and potential customers that an organisation has defined and put in place best-practice information security processes. ISO 27001 is the only auditable international standard that defines the requirements of an ISMS (information security management system). An ISMS is a set of policies, procedures, processes and systems that manage information risks, such as cyber attacks, hacks, data breaches or theft (the benefits of implementing an ISMS can be found here). Not only does ISO 27001 certification help you demonstrate good security practices, thus improving relationships and retaining your existing clients, but it also gives you a proven marketing edge against your competitors, putting you alongside the likes of Google, Microsoft and Amazon. The average cost of a data breach is estimated at $3.6 million, according to IBM. ISO 27001 is the accepted global benchmark for the effective management of information assets, enabling organisations to avoid costly penalties due to non-compliance with data protection requirements and financial losses due to data breaches. Cyber attacks are increasing in volume and strength daily, and the financial and reputational damage caused by an ineffectual information security posture can be disastrous. Implementing an ISO 27001-certified ISMS helps to protect your organisation against these threats and demonstrates that you have taken the necessary steps to protect your organisation. 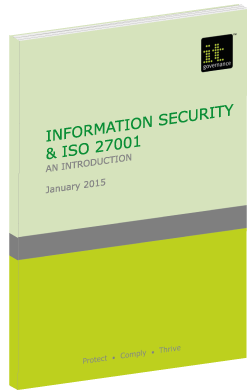 ISO 27001 is designed to ensure the selection of adequate and proportionate security controls that help to protect information in line with increasingly rigid regulatory requirements such as the GDPR (General Data Protection Regulation), the Directive on security of network and information systems and other cyber security laws. Certification to ISO 27001 helps organisations become more productive by clearly setting out information risk responsibilities and improving policies and procedures. Certification provides a globally accepted indication of security effectiveness, negating the need for repeated customer audits, which reduces the number of external customer audit days. ISO 27001 certification involves an independent assessment that provides an expert opinion of whether the ISMS is functioning properly and provides the level of security needed to protect the organisation’s information. IT Governance is internationally recognised as the authority on ISO 27001. Our team led the world’s first ISO 27001 certification project, and since then we have trained more than 7,000 professionals across the world on ISMS implementations and audits.